100 Inspirations: the "it" list... May 13, 2011! Welcome to another inspiring installment of the IT list... take some time to be inspired by these amazing blogs - and Happy Friday! one hundred inspirations recreates this gorgeous 70's inspired Elle Machpherson look on a budget - I am really loving this look! baby shopoholic got some great pieces and great deals at baby Gap recently. I can't stand how cute this denim moto jacket is! good tots rounds up 'sweet' macaron themed items from etsy - perfect for the francophile gal in your life. This poster is just too, too cute! along abbey road is giving away a gift card to Anthropolgie... need I say more? Pop on over to enter why don't you!?! thought and musing has the most perfect outfit for a picnic if there ever were one. And I am absolutely in love with her hat! 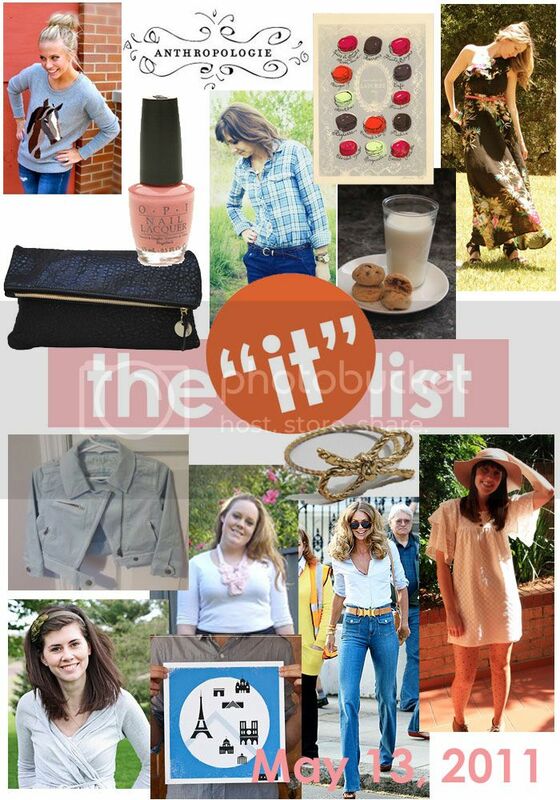 the IT list is produced weekly by jill of good life for less, for information on how you can be involved, click here!